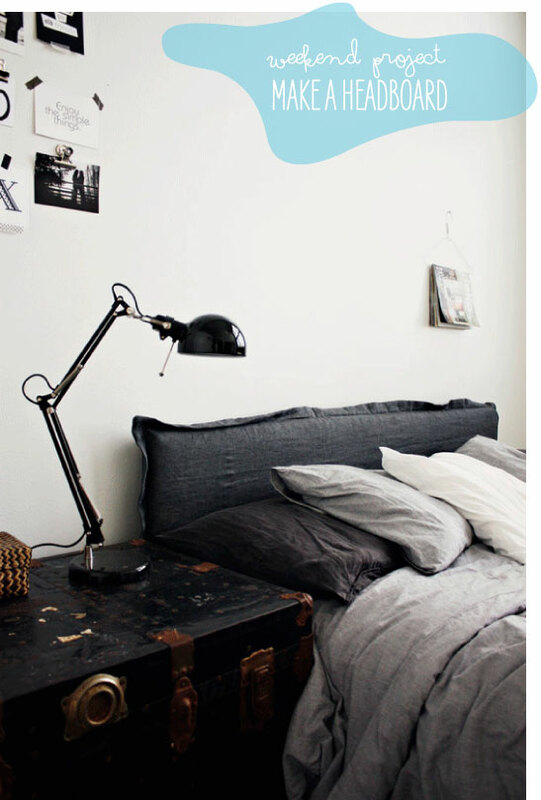 Headboard DIY's have to be one of my favourites. They can make such a difference to a room and are perfect weekend projects for the changing of the seasons. I love this linen one that I came across recently from Likainen Parketti | Lily. Made out of linen and flock, she sewed this very simple, understated headboard cover. She doesn't give instruction for it, but by looking at it I'm thinking it's not too hard to figure out. I like the sewn border around the outside edge too (although you wouldn't have to). How to: After measuring out your headboard allow yourself a few inches (including a seam allowance) outside the size of your headboard for the fabric (say 3 inches). Then after cutting out the fabric - sew the first edge (inside out) all around (3/4" seam allowance), and then after ironing the seam flat and cutting into the seam allowance corners so that they pull out evenly to make a nice outside corner) return the fabric to the good side (iron flat) and sew a 1-2 inch border (your call) around the entire edge. Then finish off the opening edges. That's about it - and assuming you already have a headboard to cover - and depending on how puffy you would want it to be, you could pad the headboard with a thin foam (available at hobby/fabric stores) wrapping both the front and back (maybe hand sew together at both ends). Then cover with your new fabulous fabric cover! Happy project! See more of this project by clicking here. i'm in love with the picture above. between all the greys + the vintage trunk, i don't know which i like more. This is a great project. It would be so simple to mix up with different fabrics! UGH this is too perfect. Can't wait for a blog post about it! Great idea, and seems easy enough. I just covered my headboard and did the staple gun version to avoid having to sew. Worked really well. I love ideas like these to allow us to change out the look of our furniture without actually having to buy new stuff!